Challenging’, ‘frustrating’ and ‘painful’ – just three of the many adjectives used to describe St Helier Yacht Club’s recent International Yacht Race to Biscay – but ultimately fun and rewarding. 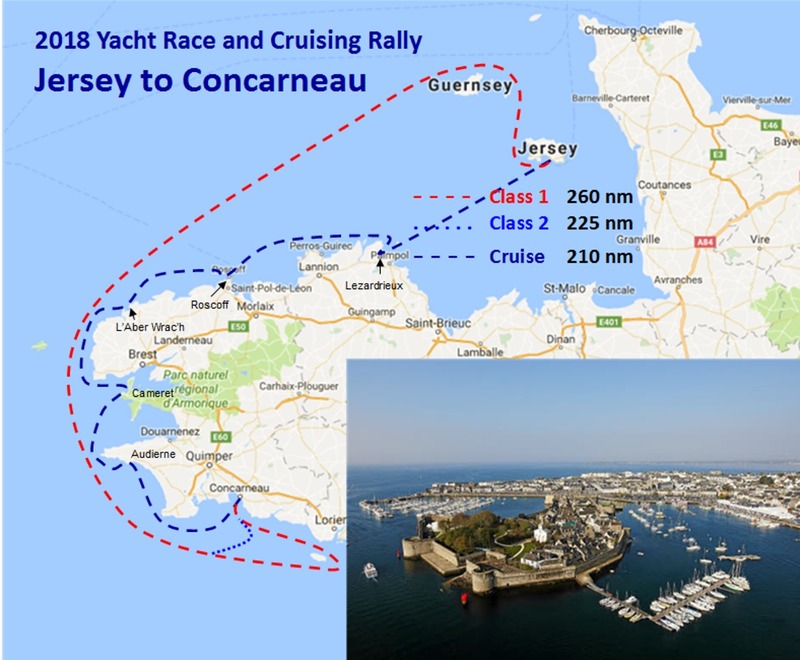 Held every two years, 18 yachts set off from St Helier on Saturday 21 July, their crews looking forward to exciting and competitive sailing as they headed for Concarneau in Southern Brittany. The reality, alas, was somewhat different. 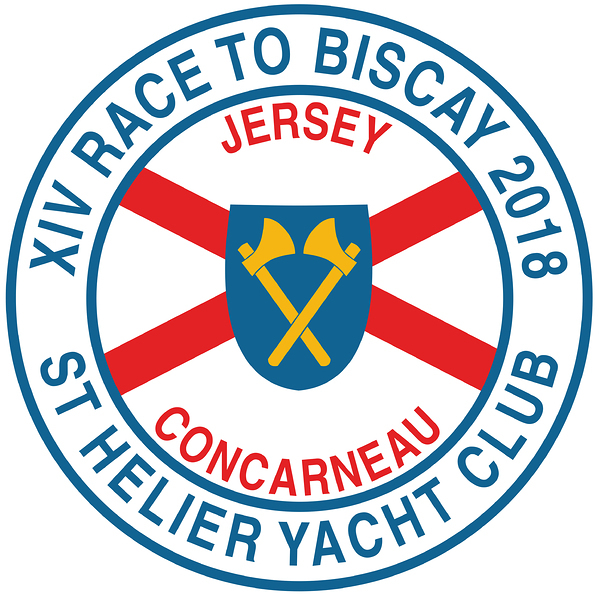 Clear blue skies, high temperatures and glassy seas may have been perfect for beach-goers but for the sailors from Jersey, Guernsey and France the light and variable breezes made for desperately slow progress for much of the race, the longest on the club’s calendar. This was especially the case during the early sections that took them north to the Banc Desormes buoy, midway between Jersey and Sark, and then south-west along the North Brittany coast. At times skippers found that although their yacht was sailing well the opposing tidal current was matching their efforts knot for knot and the chart plotter revealed they were actually standing still or going backwards. When the wind died many skippers were forced to anchor, in one case at a depth of some 85 metres. Once around the north-west tip of Brittany conditions improved slightly for the fleet, the change of direction offering fine spinnaker runs for many, but again the weather gods proved unfriendly and very light and variable breezes forced some skippers to retire. In the end it was Jeff Speller’s trimaran Aquafly that crossed the line first, some 63 hours, 22 minutes and 10 seconds after the start gun, very close ahead of the first monohull, Zanzibar, skippered by Alan Stevens. The race sponsor on Chez Moi was hot on his heels – a very close finish after 250 miles. In all seven yachts either retired or failed to finish before the cut-off time, with the last official finisher being Peter Funk’s Morrina lV, some five hours, 16 minutes and 45 seconds after Aquafly. Handicaps, of course, changed everything, with Paper Tiger (Peter Crabb/Peter Williams) claiming first place overall. Second was Wandering Star (Michael Foreman) while third was Knight Star (Arthur Manning). In the class results the IRC 1 trophy went to Abrcadabra (Rhys Perkins) and the IRC 2 trophy went to Wandering Star. Further awards went to Mystique of Jersey (Chris Fritot/Debs Hutchings) for being the first two-handed crew to finish, while Zanzibar took the Treyona Cup for the first monohull to cross the line. Speaking at the prize-giving ceremony, held at the French port’s impressive sailing centre, St Helier Yacht Club Commodore Steve Pearl described it as a great race, despite the challenging conditions, and thanked sponsors Island Ark and Go-Sail.je. for their support and the race organisers for all their hard work. Bruno Quillivic, Concarneau’s Deputy Mayor, and Port Director Arnaud Ricard, who were presented with race pennants by Race Director Julian Barber, attended the ceremony. 'We are very pleased that your race has come to Concarneau,’ said M Quillivic, ‘and we will always be happy to welcome seafarers from Jersey. Ere Hud, Minstrel 2, Fille de Feu Vl, Chevalier, Mr Scarecrow, Leapfrog and Ocean Star did not finish.